However, in the direct emails from Twitter, users were already getting the shortened links from twt.tl. After the official launch of twee.tt, all URLs will be shortened by the new one. .tt is the country code top level domain [ccTLD] for Trinidad and Tobago. This may have both good and bad impact on Twitter users. On one hand, the shortened links will save people to visit any malicious content. If the link is flagged or known as spam, users will be redirected to a warning page. On the other hand, this may weaken the relationship between Twitter and Bit.ly. While writing this post I came to know that the most popular Business networking site, LinkedIn is also going to launch its URL shortener lnkd.in. Stay tuned for more updates. Well, Do you think, Twitter should leave Bit.ly and bring it's native URL shortener? Or Twitter should go for Bitly.Pro? Do tell me if you liked these twitter birds? After a long time I worked on Coral Draw. I dont know how many domains related to twitter have been created! Good to see you following Mashable and Techcrunch regularly. So many short url sites. But this domain is good. I hope that Twitter will become more safe . 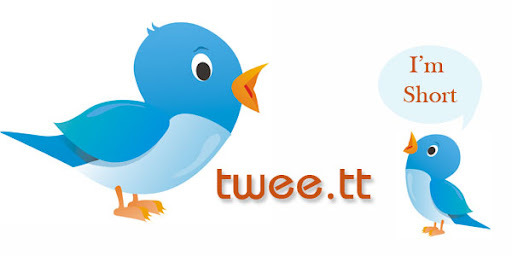 I feel that twitter isn't a microblogging platform but a link sharing platform!